Home » General News » The Admin Navigation has been Improved! The Admin Navigation has been Improved! 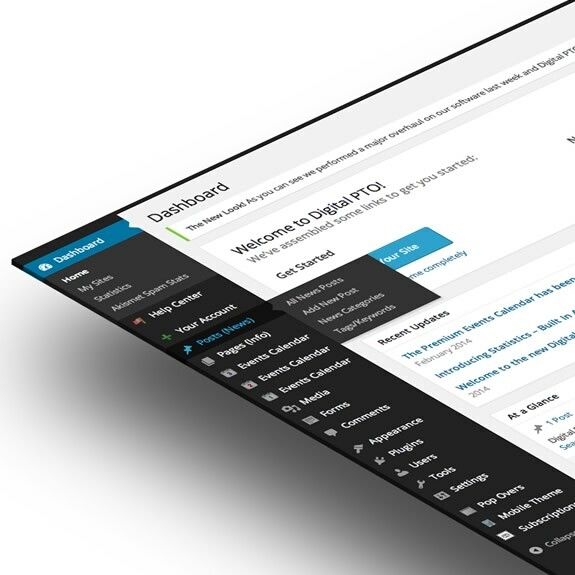 As you may have noticed over the past few weeks, we’ve been making major improvements on the Admin Dashboard of your Digital PTO website and today we have performed a subtle, yet very important, change to the Admin Navigation Bar in your Dashboard. You will notice that menus have been moved around to better fit with their purpose, some wording has been changed to be more understandable (for example, GDE changed to Document Embedding), and we’ve even added some shiny new icons to clean it up further. Everything that was an option to you previously is still available to you, nothing has changed, we’ve only moved some things around. If you have any questions about where something is, drop us a note! Comments Off on The Admin Navigation has been Improved! «The Premium Events Calendar has been upgraded!